A pair of words are considered similar if they mean the same thing, or are used in the same context, for example teacher, students, classroom. Words are also similar if one is a type of another, for example terrier, dog, and mammal. Measuring similarities between words is needed in many text mining tasks. The total number of web pages can be estimated using any common word, for example “the” present on every page. To calculate the NGD between a pair of words, all we have to do is use the Google search engine three times to get the respective number of pages. There is even a web based calculator that one can use for this. To put the similarity between “baseball” and “cricket” in perspective, I decided to pick another eight words related to different sports. These are: “soccer”, “football”, “basketball”, “hockey”, “skiing”, “surfing”, and “swimming”. Using the web based NGD calculator, I ended up obtaining the following matrix representing NGD between different word pairs. 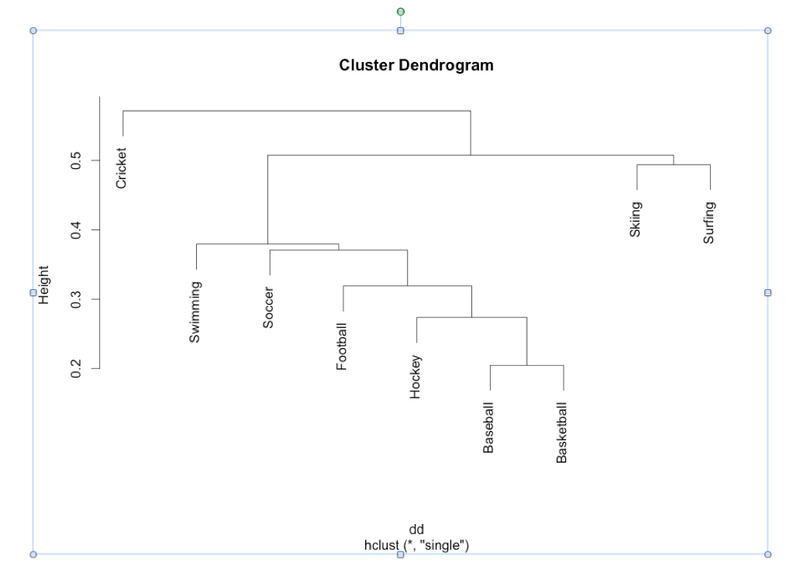 Using R, I decided to cluster these words using single link clustering. The resulting dendrogram is shown below. Now this clustering result shows some interesting results; it doesn’t show baseball and cricket close to each other but rather baseball and basketball are shown to be most similar. It also shows hockey, football, and soccer to be close to each other. One explanation why baseball and basketball are deemed most similar on the basis of the NGD is that both these games are predominantly North American games and a very large number of websites in USA are devoted to sports as well as all newspapers carry stories about these sports. On the other hand, cricket playing countries, for example Australia, England, India, Pakistan, Sri Lanka, do not play baseball and thus websites from these countries are not likely to have mention of both baseball and cricket on the same page. So what can we say about NGD from this simple exercise? Well! the NGD appears to have a hidden geographical component in it and there might be an application where this could be exploited. the link of NGD calculator not available , is there are another resources ?? I am not aware of any other resource. But calculating the distance between few words is straightforward. However for a lage number of words, you will need a script. Here is one such source. I haven’t played with it. So I cannot vouch for its accuracy.